When you think of Logan Airport, trees are not the first thing to come to mind. But Mass Port Authority has been working to change that over the past decade as more than a thousand trees have been planted on airport grounds, with about a thousand more planned within the next decade. 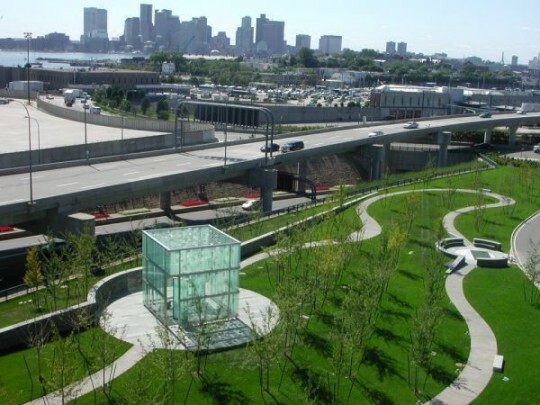 John Krajovic and John Carli of Mass Port Authority spoke at the most recent Boston Urban Forest Council meeting May 22 about their work to make the outdoor spaces at Logan – the gateway to New England – evocative of a classic New England landscape. They have also been working very hard to integrate the airport more successfully with the residential areas of East Boston at the borders of the airport. The meeting was a wonderful opportunity for MassPort, BUFC, and the Boston Tree Party to discuss our similar work in integrating trees in industrial / urban areas often dominated by concrete. The main conclusion was that long-term care and maintenance is truly the key to success in ensuring that trees not only live, but thrive. So make sure to keep a close eye on your apple trees and they will reward you with decades of delicious fruit! «« PREVIOUS: Growing the Party: Twelve new Tree Planting Delegations and more on the way!